This footage is UNBELIEVABLE. It was sent to me by a friend that lives in China and as far as I know it has not been posted on the internet in the U.S. until now. I have seen other videos of the explosion but they weren’t quite as close in proximity as this one is. Timing is everything and the English speaking man (possibly an American) that shot this video with his cell phone actually managed to film the very 1st explosion that occurred. There were multiple explosions however and the final explosion was so huge that it lit up the entire sky. One lady that lives about 2 miles from the explosion actually thought that it was an earthquake and quickly evacuated her home. My Chinese friend referred to this as “The Chinese 9 11”. 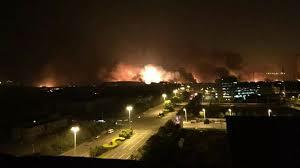 My heart goes out to all of the people that live in Tianjin. At latest count, there are over 500 people injured and 44 reported dead but may have changed by the time you read this.